Hi! I’m Lori! I have my own blog, dedicated mostly to sewing projects, called love hazel. I would love for you to visit me there! I also have an etsy shop where I sell handmade boutique quality clothing for little girls which you can access from my blog. (my shop is currently on vacation while I work out a few kinks, but will be back up soon). I’m so excited to be a guest blogger today and I am so flattered that Melissa asked! Thanks, Melissa! So… the Derby. aaaah, the Derby. I lived in Louisville for several years before I got married, then moved to TX for 1 year, and returned to live in Louisville for several years after I got married. I actually attended the Derby 2 years. The first year I went to the infield. There are some things I saw that day which will be burned in my memory forever. Wow. The next year I went with my family and we stayed in the paddock area, which was much more my speed and a much more enjoyable experience. I must say though that either way, the excitement is palpable and there is no place better for people watching! Now that I live in NC, I miss Derby time, but in the years since I have left, I have never missed a Derby race! It’s something that becomes a part of you once you live there. I always loved looking at the jockey silks in the racing booklets at the track. They are so colorful and bright. I also like to keep placemats on our kitchen table which pertain to whatever the current holiday is. I’m always at a loss after Easter and my table usually remains bare again until fall. So, this idea was born. 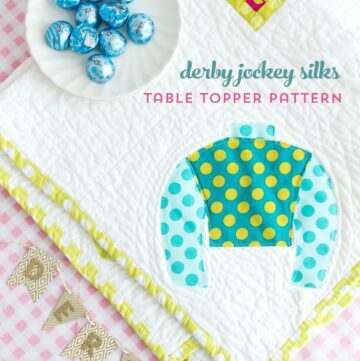 Derby Placemats. They were very easy to make. I just drew a jockey silk and cut it out of some colorful fabric. Then used a fusible web that you can sew on to adhere it to a 12×12 square of another colorful fabric. Sewed around the edges of the silks, backed it with 12×12 square of white muslin, then sewed the border around each edge. I made the bias tape for the border, but you could totally buy some already made. In fact, I would recommend that because that was the part that took me the longest. Another thing that I think is worth mentioning since we are talking about table decor, is the collectable Derby glasses. I have quite the collection! These are actually the glasses we use to drink out of daily as they are such a nice size. I started collecting these way back when I lived in Louisville as a single woman! They make a different one each year and sell them at local stores. The winners from every Derby are listed on the back of each one up to the current year. Below I have pictured glasses from the year I was born, the year I graduated from high school, and May 3, 1997, the day I got engaged (Derby 123)! My sister still lives in Louisville and gets me the new glass each year. This year she is getting me an Oaks glass too so I will start to add those to my collection! 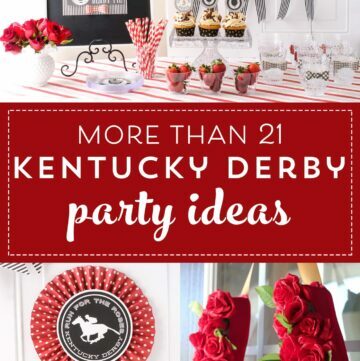 Love the Derby glasses and actually use them on my table every day, although they are a great addition to any Derby decor. 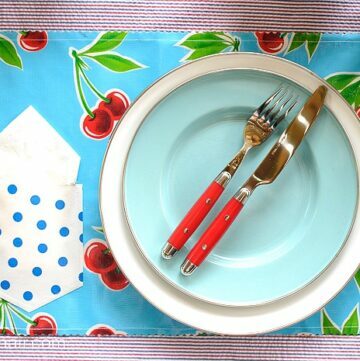 Below is a close up of the 4 place mats I did. I loved how they turned out. I think you could also totally do a quilt with these as the blocks if you so desired. Just a thought. Hope you enjoy this Derby idea. Right now, the place mats are on their way to KY. I decided to give them to my sister (who also likes to decorate with themed place mats) to thank her for all the Derby glasses she has purchased for me over the years! Well, thanks for reading, and thanks again, Melissa for having me as a guest! It has been fun, and truly an honor. Hi Lori! My husband is a jockey and I want to do my kitchen in a jockey theme. I looove these mats. I know you made these as a gift, but would you be interested in making some to sell? Please email me! Thank you!! I don’t think Lori is selling them… but I’ll email her and let you know.